Proper care keeps underarms soft and odor-free. Unless you've forgotten to wear deodorant to school or work, you probably don't give your underarms much thought. Your underarm skin is very sensitive, though, so it needs a bit of special care to stay healthy. Shaving is a necessary evil that can cause skin irritation, but you don't need to toss the razor and let your armpit hair grow wild. Keep your skin moisturized and shave properly for armpits you'll love to show off. Wash your underarms daily with a gentle cleanser and warm water. The cleanser kills bacteria that cause underarm odor. Shower with warm water for a few minutes before shaving. Warm water softens armpit hair, so you won't need to work as hard to shave it off. Shave in the evening before bed, if possible. If you cut your armpit with the razor, resting the skin overnight gives it a chance to recover. Apply shaving cream or shower gel to underarms before shaving. These products lubricate underarms and allow the razor to glide over skin easily. Use a fresh razor when shaving. If your razor is dull, you'll need to press down harder to shave off hair. Then the razor scrapes against your skin, causing nicks and irritation. Replace your razor after a few weeks of use. Shave your underarms in the direction of hair growth. 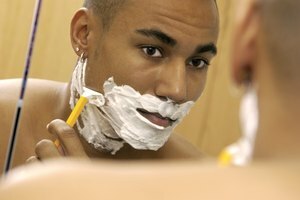 If you shave in the opposite direction, you're more likely to cut yourself or cause irritation. Your underarm hair may grow in different directions, so you'll need to adjust the angle of the razor as you shave. Wait for at least 10 minutes after shaving to apply deodorant. If you put on deodorant too soon, it can seep into open cuts. This may cause irritation or a rash. Apply a deodorant that contains soothing ingredients, such as avocado oil, chamomile, glycerol or sunflower seed oil. These ingredients smooth and hydrate skin. If you have trouble shaving, consider waxing your underarms. Waxing doesn't cut or irritate your skin like shaving does. Hair removed by waxing takes longer to grow back. If you want to wax, you'll need to grow your armpit hair to at least 1/4 inch length first. King, Melissa. "How to Care for the Underarm Area." Synonym, https://classroom.synonym.com/care-underarm-area-11784.html. Accessed 22 April 2019.